Chocolate martinis make a perfect nightcap after a heavy meal. 1 What Drinks Can I Make With Banana Rum? 2 What Soda Do You Use With Whipped Cream Vodka? 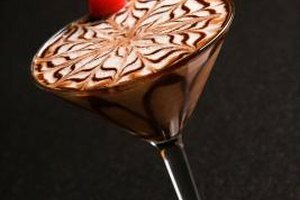 3 Chocolate Martini: How Many Calories? 4 What Kind of Mixed Drinks Taste Like Butterscotch? Chocolate vodka makes a sweet drink on its own served up or on the rocks, but adds its sweet chocolaty flavor to mixed cocktails as well. Knowing what is good to mix with chocolate vodka opens up a world of dessert beverages to drink when eating a brownie sundae seems just a little too heavy. Mixing chocolate vodka with other liqueurs and mixers gives it mileage in many party and after-dinner cocktails. Add chocolate vodka and cream to black coffee for a warm after-dinner drink that's not overly sweet. Combine that with Irish whisky and substitute Irish cream liqueur instead of cream to add a bit more kick. Add chocolate vodka to hot chocolate and just a splash of creme de menthe for a grasshopper-style soother. Chocolate vodka also mixes well with nutty liqueurs such as amaretto, hazelnut liqueur or walnut liqueur when added to coffee or hot chocolate. Top with whipped cream to cut some of the sweetness. Chocolate vodka makes the perfect base for dessert martinis. Fill a shaker with ice and add chocolate vodka to the halfway mark. Fill the remaining space in the shaker with mixers and liqueurs to complement. Try espresso-flavored liqueur and cream for a chocolate espresso martini. Creme de cacao and white chocolate liqueur creates a martini that closely resembles a malted. Try cherry liqueur and grenadine with just a little milk to create a chocolate covered cherry martini. Mix it up with raspberry or strawberry liqueur or try it blended for a grown-up smoothie. Garnish with drizzles of chocolate syrup or a fresh berry skewer. For simplicity, try a simple soda. Chocolate vodka mixes well with cola or cream soda for an old-time fountain-style drink on ice. Showing its versatility, chocolate vodka can also substitute for regular vodka in a number of rocks drinks, giving them just a bit more sweetness and flair. Try mixing chocolate vodka, coffee liqueur, and milk or cream, and serve over ice for a chocolate Russian. Mix chocolate vodka with soda water and peppermint schnapps for a fizzy candy cane. 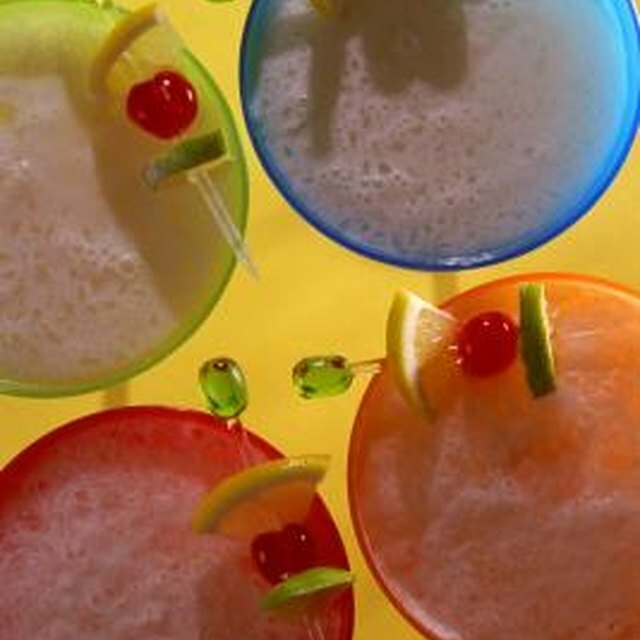 For big parties or intimate adult celebrations, shots can definitely turn up the fun meter. Always chill shots made with chocolate vodka for smooth swallowing. Mix up the chocolate vodka with vanilla vodka or liqueur for a milkshake shot. Try substituting chocolate vodka for regular vodka in strawberry gelatin shots for a chocolate-covered strawberry. Make chocolate pudding shots, substituting half of the milk required in an instant chocolate pudding mix for chocolate vodka. What Liquor Do You Mix With Eggnog?